"Given the kinds of statistics I've outlined - that is, too many churches for the numbers of priests and worshippers we actually have - it's no wonder that many bishops have readily borrowed ordinariate priests for their dioceses. "Anglicanorum coetibus was, in this sense, an unexpected windfall of additional clergy. There are, I believe, currently 60 ordinariate priests on loan to the English and Welsh dioceses, with most of these assigned to parishes. I recognise, of course, the benefits and expediency of such arrangements. As it happens, I have been glad of 'borrowed' ordinariate priests in two dioceses I've lived in. Bishops need priests, and priests - and their families - need stipends. Nevertheless, I don't think the current model of plugging gaps in ordinary diocesan provision is, in the long run, a sensible one for either party. "From my outsider's view - I'm neither a member, nor eligible to become one - the ordinariate offers the Church in England and Wales (Scotland too!) a significant pastoral opportunity: the possibility of a permanent structure, fully part of the wider Catholic community, but with its own distinctive liturgy, spirituality, musical traditions, parish culture and atmosphere. Rather than being simply a one-off fix to bring a wave of former Anglicans into full communion with Rome, it is genuinely sustainable. It is continuing to attract former Anglicans and others (not excluding other Catholics) on its own terms, while at the same time being a community in which children are brought up, who in turn bring up their own children in it. "Christ's Church has plenty of room in it for such a body, as is again amply proved by the Eastern Catholic churches ... with the ordinariate offering a niche way of 'being Church' that complements, rather than competes with, the default normal parish offering. "From where I'm kneeling, we seem to have a God-given cure to many a diocesan bishop's headache. So why are our dioceses not queuing up for the ordinariate to take otherwise under-threat churches off their hands, and on extremely advantageous terms? This is a genuine question, for I am genuinely puzzled." I have no other status in the Ordinariate than that of an incardinated retired priest. But, entirely as an individual, I agree with every word of this. I would only add something which has come to me as a widely heard rumour, with a number of sources, but for which I cannot vouch. It is that, somewhere in the Church's system, there is blockage point, a spirit of negativity, with regard to the rapid and smooth 'reordination' of former Anglican clergy ... what our jargon calls 'respraying'. I have no idea why this should be, if indeed it is so. Might it possibly be that some bishops hope their staffing problems will soon be solved by the mass ordinations of married deacons? Or do stretched diocesan finances dictate the closure of churches and the commercial development of their sites? I dunno! But I am kneeling somewhere very close to Professor Bullivant. If the English Bishops wanted an influx of what he describes elsewhere in his article as "dozens of young and energetic clergy, thoroughly immersed in British culture, and with years (if not decades) of pastoral experience as well", they could have them for the asking. They don't like married clerics. But one thing I've learnt as a traditionalist is that many of my theological bent is that tbey can't cope with with married clerics sleeping with their own wives. Maybe this carries over. Oh how much I agree with Professor Bullivant and you, Father. Funny thing about common sense though - it doesn’t seem to be all that common, especially among bishops and liberal Catholic bureaucrats. Ultimately the strength of the Church is in the parishes, not in Catholic administration centres staffed by well paid bureaucrats. Yes it does make sense and why some of the British Episcopate are not taking it up is, indeed, very puzzling. There is another aspect which comes to me. Forgive me if I get the actual figures wrong since I am relying simply on my memory. But, I am sure that I read that Nigeria has 11,000 Seminarians. I'm sure that not all of them will actually become priests but there is no way in this world that Nigeria can look after thousands of priests. I am an old man but I still have quite a good memory and I can remember Pope Pius XII commenting on Africa's need for Missionaries and he said something like "The future of the Church will come out of Africa". Dare I point out that one extraordinary Prelate has already come out of Africa in Cardinal Sarah! It is excellent news that the Manchester ordinariate is moving from the 4pm slot at S.Joseph's Heywood (publick transport via steam train!) to 11am main mass slot at S.Margaret Mary, New Moston, Lancs. A letter from the Bp of Salford on their facebook page gives the details. 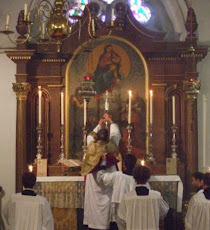 Nice to have another main Sunday Ordinariate Rite Mass in the country. I think this is an excellent idea of Professor Bullivant. Would not thriving autonomous ordinariate parishes attract many more Anglicans? This could be the future of unity? I am in the Salford Diocese, aghast at the bishop's wholesale closure programme, I suggested that he adopt the strategy of adjacent diocese and invite Traditional Orders to assist, including even [heaven forbid] SSPX. For my parish church I raised the issue of the Ordinariate and also contacted a nearby Ordinariate priest in such respect [25/8/16]. I have learn't to-day that such a decision has taken place and the Odrinariate are to take-over. I have no affiliation with the Ordinariate and attend Mass with the Oratory Fathers. I assume that the quality of liturgy to be provided will put to shame many of the NOM Masses, I hope not to be disappointed. Although there is something in Stephen Bullifant's arguement, there are many practical difficulties. It one examines the locations where viable Ordinariate groups have been set up, one will find that in almost every case, there is not a Catholic church in the neighbourhood that is anything like redundant or underused. In most cases, the Ordinariate groups are in towns where there is a single Catholic church which is already heavily used. I give as examples Tonbridge Wells Deal, Folkestone, Chichester, Huntingdon, Sevenoaks Hemel Hampstead and Worcester. In some larger towns like Croydon, it was not possible to find a conveniently located church which had spare capacity on a Sunday. Whilst there are surplus Catholic churches, these tend to be in rural areas where no Ordinariate group has emerged, or very large churches in cities like Liverpool or Birmingham which are far too big for any Ordinariate group to maintain. Yes, it is true that many of our bishops did not really understand the potential of the Ordinariate and were initially less than welcolming; but on the other hand it is difficult to see how better or more suitable churches could have been provided. As Chris Smith has pointed out, Bullivant seems to ignore the fact that the Ordinariate is not just clergy, but includes laity as well. Sometimes it seems that we laity are merely there to provide the cash for the clergy! There are 4 Catholic Churches in Hemel Hempstead, not one, and the parish clergy find these very difficult to man - one has just one Mass a week, another just two. None of them have a daily Mass any more. In the surrounding towns there are two examples of parishes losing priests and being 'merged' with another parish some miles away. Many Ordinariate worshippers already travel 10 or 20 miles to get to their Group worship, so a church on the periphery of a town or in a neighbouring town would not be a problem. While it is, unfortunately, true that moving church inevitably leads to some people being lost, if the new site enables growth that is not possible while lodging in someone else's church it is a necessary price to pay. Ordinariate missions are not there to simply serve their current members but to spread the Gospel.